Sigh. This is why you need to carefully read directions in the store when you're trying a food item you've never had before. 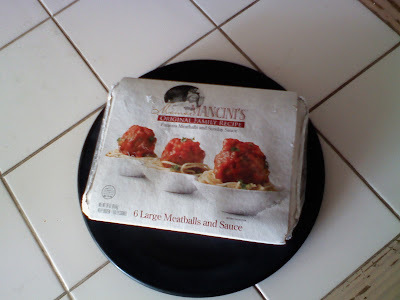 I just bought Mancini's spaghetti dinner: big meatballs with "Sunday sauce." I was totally looking forward to it; a green salad, some garlic bread on the side, an amusing little Pinot Grigio. Unfortunately, after I eagerly ripped open the package, I saw the hidden directions: "Defrost in refrigerator overnight." Oh well, I haven't ordered pizza in a while.